We've all done it. We've all sunk a ton of cash into paying a firm to build a blogger tour. Heck, I've spent a ton of money monthly paying a PR firm to "market" my backlist and releases. Money down the toilet. We've all given into temptation and taken Facebook up on their offer to "boost that high performing post". We've all spent countless hours sending ARC copies around town, only to get a trickle of useable reviews on Amazon, then to watch them disappear when Amazon deems them inadmissible. All of these and more, only to have a blip in sales here and a bump in sales there, but mostly, it's us romance writers pulling our hair out and wondering if more than just our friends and family are ever going to buy our books. Let's get real, it's a noisy market. More writers than ever before are getting into the game, so we have create a strategy that's air tight in order to cut through the noise. For too long, romance writers have used an antiquated system to try to get their books read. I've created a system that marries my favourite modern digital marketing methods with the unique needs of the romance industry. Want to get started on building your forever marketing strategy? Here are five things you can do today to get started. 1) Get real clear on who you're reader is. 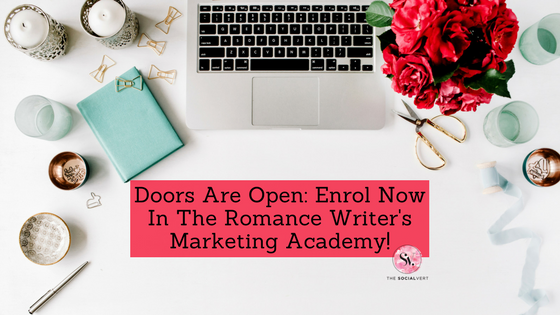 All too often, I hear my clients tell me, "I'm writing for anyone who loves romance." You need to get deeper than that. Your entire marketing strategy depends on your ability to really get inside your perfect reader's mind. Here's how I define my reader to help get you started. See how different that is? But do you also see how I can take that information and use it to develop a marketing strategy? Here's what the beginnings of that strategy would look like. Email marketing - once per month w/copy that offers travel to Ireland insight along with a day in the life material. 2) Choose one single social media platform and master it before adding a second. All too often, we try to get posting on all the platforms. All we're doing is exhausting ourselves and producing content that doesn't resonate with our audience or the audience of that platform. Go back to that perfect reader and figure out where he/she is landing the first chance they get to pick up their phone. Whatever social app are they opening first thing in the morning, be on that one. 3) Whatever social media app you choose, be consistent. Post daily if possible, but at least 3-5 times per week and mix in video content. If you're choosing Facebook, go live once a week with a pre-determined theme. Like, every Wednesday you're live talking about what you're reading, or what you're writing and every Thursday you're posting a cover photo and every Sunday you blog, or ask leading questions. Whatever you do, do it so that you're both letting your current reader go a little deeper into what makes your brand and you're introducing the real you to a potential new reader who can connect with you faster. Relationships are how personal brands grow and video is the quickest way to build them! Downloadables - these can take any form, but think along the lines of engaging your readers. You can offer these in many methods, but my preferred is via my website with a landing page pop-up opt in, so as soon as a reader lands on your website, your web page has a pop up asking if they'd like to receive your lead magnet in exchange for their email address. Just always remember to be compliant to all country's anti-spam legislation. 5) Finally, our fifth move you can start right now that will move your needle fastest towards success is to treat your writing like a business. If you're treating it like a hobby, that's what you'll get out of it, but if you're treating it like a business, and so you should, then it will slowly take the form of a well oiled, money making machine. Write, produce, market, sell and repeat. You'll need to write more, in order to get more product to market and sell. Keep track of your expenses, understand your cash flow and create a operating calendar. Track your upcoming releases. Create a 6 week launch schedule. Understand your marketing budget. Have a plan. All of these things sound like you're running a real, live business, right? I'm so passionate about authors getting their incredible work out to new readers who will become lifelong fans if you're able to nurture them along their journey with you. So, what are you waiting for? Let's get your business booming!